Blast off on a new adventure with Star-Lord, Rocket, Groot and Gamora. 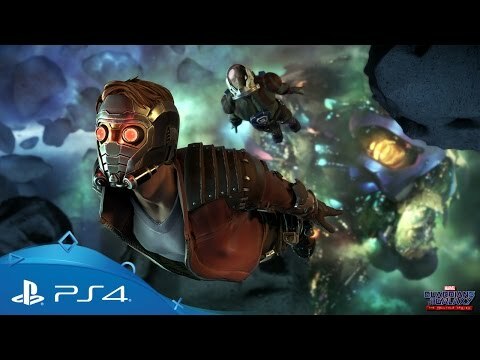 Join the Guardians of the Galaxy in an original episodic adventure from the talented folks behind The Walking Dead and Batman episodic game series. Travel to a distant Kree planet as the team take on a terrifying new enemy and, discovering a strange artefact of unimaginable power, find themselves saddled with an impossible series of choices. Featuring classic characters from all across the Marvel universe – both heroes and villains – this interactive adventure from Telltale Games places the tough decisions in your hands and challenges you to deal with their consequences. Love to play the hero? Assemble Earth’s mightiest heroes and fight for the future of mankind in LEGO Marvel’s Avengers on PS4. Step inside the suit of Bruce Wayne in Telltale Games’ unique take on the Batman universe.